OTTAWA — Health Canada says a line of cribs is being recalled due to a potential safety hazard. The federal department says the instructions provided with Kidiway's Mini-Tammy cribs may prevent consumers from assembling the item properly. As a result, there may be a safety risk for crib users. Approximately 225 of the recalled cribs were sold at Bo-Bebe in Quebec and at The Baby's Palace retail stores in Ontario. The recalled products were sold from August 2010 to June 2011. Neither Health Canada nor Kidiway has received reports of incidents or injuries related to the use of the cribs. 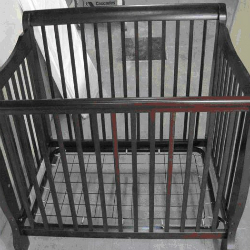 Consumers are advised to stop using the recalled cribs and to contact Kidiway for a free product replacement. For more information, consumers may contact Kidiway at 1-514-858-6336. For more information on crib safety, click here for tips and guidelines from our Trauma experts.